The latest advances and visions of future applications for nano, optics, photonics, solar, and space optics technologies will be presented by researchers and developers in conferences and an exhibition at SPIE Optics and Photonics in San Diego next month. 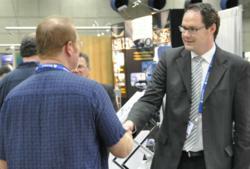 The exhibition floor at SPIE Optics and Photonics is an important meeting place for the industry. New conferences on laser material processing for solar-energy devices, photonics innovations for complex environments, x-ray free-electron lasers, and inertial-confinement fusion join those on carbon nanotubes, semiconductors, remote sensing, and more. SPIE Optics and Photonics, the largest interdisciplinary technical event in North America focused on research and technologies in solar, nano, optics, photonics, and space optics, will draw scientists, researchers, and engineers from around the world to San Diego, California, next month. The event runs 12-16 August in the San Diego Convention Center. The event includes 76 technical conferences, nearly 40 courses, an exhibition of approximately 240 organizations displaying the latest in optical components, devices, and materials for important technologies such as biomedical optics, organic photonics, nanotechnology, and solar energy, and numerous networking opportunities. Representatives of the U.S. National Academies committee who have worked on the soon-to-be-released update of the 1998 “Harnessing Light” survey of the optics and photonics industry will be in the exhibition hall during the week with summary results of the report. Committee members including cochair Paul McManamon (University of Dayton and Exciting Technology) will present an overview of the grand challenges and opportunities identified in the report, along with economic impact data. The report is expected to be released to the public in mid-August. New conferences on laser material processing for solar-energy devices, photonics innovations for complex environments, x-ray free-electron lasers, and inertial-confinement fusion join an established program including papers on carbon nanotubes, next-generation solar cell technology, organic semiconductors, remote sensing, and other topics. All-symposium plenary speakers Vladimir Shalaev (Purdue University) and Bahaa Saleh (CREOL, the College of Optics and Photonics, University of Central Florida) will give the first of many in-depth looks into the future on opening day. Shalaev will discuss the use of optical metamaterials to shape light for new applications ranging from a flat magnifying hyperlens to an invisibility cloak. Saleh will look at the potential for increasing applications of light in carrying information and the development of new synthetic materials with never-before-observed optical properties. Conference tracks will also be highlighted by 19 plenary talks, and several panel discussions on technical and industry topics are scheduled throughout the week. CEUs are available for courses and professional development workshops, with expert presenters offering basic to advanced instruction on topics including optical engineering, nanotechnology, image processing, illumination, solar, and remote sensing. Student-focused opportunities include a student chapter leadership workshop, the annual Optics Outreach Olympics demonstrations and competition, and several networking events. The three-day, free-admission exhibition runs 14-16 August, and will host the SPIE Job Fair on 14 and 15 August along with new product announcements and demonstrations from Iridian Spectral Technologies, TRIOPTICS, Micro Laser Systems, and Precision Glass & Optics. Companies and not-for-profit organizations will demonstrate how photonics technologies benefit the world economy and quality of life in the Photonics for a Better World area of the exhibition hall. Conference proceedings will be published individually in the SPIE Digital Library as soon as approved after the meeting, and also in collected print and digital volumes and collections.